Do You Know that you can search just this 1897 book by using the 1897 button in the Partitioned search engine at the bottom of the Current What's New Page? From History of Tioga County, Pennsylvania. Harrisburg, PA: R.C. Brown, 1897. Reprinted Salem, MA: Higginson Book Company. pp. 639-649. Organization - Physical Characteristics - Soil and Products - Coal and Iron - Timber - Streams - Population - Pioneer Settlement - First White Men - The District Line - Williamson Road - The Block House - Anthony, the First Landlord - Other Early Settlers - Mills and Other Enterprises - Physicians and Justices - Schools - Churches and Cemeteries - Societies - Liberty Borough - Villages and Postoffices. Liberty township was organized in February, 1823, and was taken from Covington and Delmar townships. It lies west of Union township; east of Morris; south of Bloss and Hamilton, and has the Lycoming county line for its southern boundary. Its northern boundary line passes along or near the crest of the Briar Hill range. The northern third of the township is, therefore, broken and rugged. The remainder, which may be described as an upland plateau, slopes away more gently toward the south, with as large a percentage of comparatively level area as is to be found in any other township in the county. The soil is fertile and fruitful, producing abundant crops of cereal grains, meadow grasses, garden vegetables and orchard fruits. The farmers are thrifty, frugal and prosperous, a large percentage of them being of German descent. Coal and iron ore exist in the Briar Hill range, but have not been found in quantities sufficient to invite development. The township, when first settled, was heavily timbered, hemlock, maple, cherry, chestnut, beech and oak predominating. White pine was found only in limited tracts. The drainage of the township is toward the south and southwest. Zimmerman creek, which rises in the Briar Hill range, flows southwest into Morris township, receiving Fall creek, which flows from the north, near the township line. It drains the western and northwestern parts of the township. Black’s creek rises north of the center of the township, pursues a slightly southwest course to the Lycoming county line, soon after crossing which it unites with Block House run. This latter stream rises north and east of the center of the township, and pursues a winding course toward the southwest, through Liberty borough, about a mile southwest of which it passes into Lycoming county. It has several small branches. The eastern part of the township is drained by Mase run and Sadler run, two small streams fed by springs. The township was one of the earliest settled in the county. With the exception of the mountainous area along the northern boundary line, it is thickly populated, and notwithstanding the fact that there is not a line of railroad within its borders, its people are fairly prosperous. Its growth from the first has been healthful, each decade showing a fair average increase of population. In 1840 there were 1,128 inhabitants; in 1870, 1,379; in 1880, 1,629, and in 1890, 1,755. In 1895 the taxable value of property - including Liberty borough - was $519,455. The first white man to enter the confines of the township, except, perhaps, an occasional hunter, trapper, or Indian scout, were the early surveyors. The District Line was established in 1781, and the Academy and other lands surveyed as early as 1786-87. The District Line referred to is the line between Survey districts Nos. 17 and 18. It runs from the southern to the northern boundary line of the county, and passes over the Main street bridge, in Liberty borough. The history of the township, however, begins with the construction of the celebrated Williamson road, from Loyalsock, in Lycoming county, to Painted Post, New York. This road, which was begun in May or June, 1792, enters the county and the township east of the District Line. About 200 rods north of the county line it turns northwest to Block House run, crossing it at a point now the center of Liberty borough, of which it forms the main street. It then turns north, which direction it follows to the township line, over the Briar Hill range, and on to Blossburg, thence down the valley of the Tioga river to Painted Post, New York. In the construction of this road it became necessary to establish depots for supplies at convenient points, and also to erect log houses for the protection of the women and children. One of these was established at the point where the road crosses Block House run, in Liberty borough, on the site of the present Liberty Hotel. It became known as the "Block House," and gave its name to the stream, beside which it stood, and to the village that afterwards grew up around it. This house was kept in primitive times by one Anthonyson, a sort of half French and half Dutchman. Anthony, according to his own story, had spent most of his life as a soldier, during the stormy times of the French Revolution; and he thereby neither improved his morals nor his fortune. He had no scruple, by way of amusing his guests, of boasting of his bare-faced villainy. There was no one of the ten commandments which he had not specifically broken time and again. With the habits of the old soldier, he had little disposition to get his living by tilling the ground; and found the military mode of pillage much more to his taste. He raised no oats, but always charged travelers for the use of his troughs, and for sleeping before his fire. Whiskey was the staple commodity at his house, serving as meat and drink. Many of the early immigrants to the Genesee country drove their young cattle along. There was a wide track of some fearful tornado nor far from Anthony’s house, in which he contrived to cut an open space, with a narrow passage into it, making a kind of unseen pen. To this spot the cattle of his guests were apt to stray in the night. In the morning the poor immigrants were hunting far and near for their cattle, with Anthony for their guide; but on such occasions he never happened to think of the windfall. The unsuspecting guests, after two or three days of fruitless search, would leave, paying roundly for their detention, and instructing the scoundrel to hunt the cattle, and when found to write to a certain address, with a promise of reward for his trouble. Anthony never had occasion to write; but it was always remarked that he kept his smoke house well supplied with what he called elk meat. When or where he caught the elks was never known. Some lone travelers, who stopped at his house, it is strongly suspected, never reached their intended destination. Anthony left Block House in 1813 for Williamsport, and was killed by the falling of a tree. He lies buried near Trout Run. Soon after 1800 a man named Sullard - the names of James and Stephen Sullard appear on the assessment list of 1812 - came into the township and settled near the present residence of Isaac Miller, in Liberty borough. A son was added to the family soon after their arrival, being the first white child born in the township. Nauglesmith Bauer came before 1808, and settled where Scott Cowlick now lives in the borough. In 1813 Jonathan Sebring, a native of Berks county Pennsylvania, became the successor of Anthony as landlord of the Block House tavern. He was an honorable and upright man, and kept a reputable and respectable house. He removed to Humboldt, Sauk county, Wisconsin, in 1857, where he died in February, 1879, at the advanced age of ninety-six years. He was a shoemaker and worked at his trade in connection with his hotel. In February, 1814, John Sheffer, Sr., a native of Lancaster county, Pennsylvania, removed his family from Williamsport, where they had resided for several years, and settled on 150 acres of Academy land, on Sheffer Hill, just north of the borough. At the time of Mr. Sheffer’s coming there were but eleven persons in the township. He early became a prominent and leading citizen of Liberty. About 1814 a body of United States troops, en route for Buffalo, New York, encamped in Rehn’s Hollow, on Laurel Hill, and excited the interest and curiosity of the settlers. About this time also Daniel Hartsock settled just east of the borough, on the farm now owned and occupied by Levi Hartsock. John Levegood, a native of southern Pennsylvania, settled about 1814-16, just west of the borough, on Academy lands. He was one of twelve settlers in the Block House neighborhood to whom a donation of fifty acres each of Academy land was made in order to induce them to settle. Peter Moyer came in 1815 and settled west of Black’s run, on land previously occupied by Henry Hews. Frederick Heyler, Sr., a native of Germany, settled about 1818 on Briar Hill, and soon had for a neighbor Michael Linck, also a native of Germany. Simon Sindlinger and his stepson, George Hebe, natives of Wurtemburg, Germany, settled in 1819 in the eastern part of the township. Mr. Hebe was a soldier in the Mexican War, and served under Colonel Wynkoop in the First Pennsylvania regiment, and was promoted from private to staff officer. War of 1812, and was later successively commissioned captain, major, colonel, and on June 22, 1854, a brigadier general of militia. Among other early settlers may be mentioned: Joshua Dartt, who located in the northern part of the township in 1817; Michael Dehr, who came in 1819, as did also Frederick Bower and Henry Christ; Samuel, John and Henry Gleckler, who settled at East Point about 1820; John Knodel, who served under Napoleon; Michael Krause, John H. Stinehofer, the first physician; John Marquart, Lewis Schneck, John T. Peck, Philip Zink, Jacob Boger, who settled near East Point; John Leinhart, who settled on Briar Hill, and John Reed, all came about 1821. Jacob Brownmiller and Jeremiah Maneval came in 1822, as did Solomon Roupp, who located near East Point, and Oliver Pierson, who settled at Nauvoo. In 1824 George Hart, a Revolutionary soldier, and his son, John F. Hart, became the first settlers near the site of Hartford postoffice, between Liberty borough and Nauvoo. In 1825 Leonard Schambacher and Leonard Shick settled near East Point. These were the principal settlers of the township during the first quarter of the present century. The work begun in the midst of the wilderness by these sturdy pioneers has been carried forward by their descendants until Liberty township is to-day one of the best cultivated and most prosperous townships of the county. The early settlers in and around Block House were dependent for several years upon the grist-mill and saw-mill of Peter Sechrist, erected about 1811, at the falls on Block House run, about a mile south of the county line, in Jackson township, Lycoming county. About 1825 Henry Hartley erected a saw-mill on Black’s creek, near the county line. It was bought in 1827 by James Freeze, who also erected a grist-mill. A few years later these mills became the property of Jeremiah Black, a cousin of the celebrated jurist of the same name, and were operated by him and his sons for more than half a century. About 1830 Joseph Hagenbach erected a saw-mill on Block House run, in the northern part of Liberty borough. It was afterwards owned and operated by Jonathan Sebring, Robert C. Cox and Jonathan Raker. It was burned, and Francis M. Sheffer bought the site and built a new mill, which also burned and was rebuilt. Jonathan Kreiger then purchased the property. In 1890 the mill was again destroyed by fire, and the present steam saw-mill and planing-mill was erected near its site. Sheffer established a wagon shop in Liberty borough, which has been conducted by himself and his sons down to the present time. Among the saw-mills erected between 1830 and 1840 were one on Zimmerman’s creek, about Nauvoo, by John W. Frederick; the Oliver Pierson mill, on Fall creek, north of Nauvoo; the Leonard Schambacher mill, near the site of the steam saw-mill now operated by Solomon Roupp, half a mile east of East Point; the Frederick Bower mill, afterwards owned by Philip J. Kohler, on Block House run, east of Sebrings, and the Frederick Boyer mill, northwest of East Point. In 1838 Charles F. Veil erected a tannery at what is still known as Veiltown, about a mile north of Liberty borough. It was operated by Mr. Veil and his sons for over thirty years. About 1838 a saw-mill was erected on Block House run, near Veiltown, by James Merrill, and a grist-mill about 1841. From 1867 to 1884 the mills were owned by William Keagle. In the latter year Washington Newberry bought the property. The saw-mill has not been operated for many years. The grist-mill is known as Liberty mill. About 1838, also, a grist-mill was erected at Nauvoo by John J. Herman. It has been operated by Caleb A. Comstock, Daniel W. Canfield, who added a saw-mill in 1848, and others. The grist-mill alone is now running. It has been owned since 1889 by Adam Coppersmith. The following named physicians have practiced in what is now Liberty borough: John H. Stinehofer, who came before 1825 and remained about three years; Dr. Richard B. Hughes, 1828 to 1842; Benjamin C. Morris, 1835 to about 1837; Jacob Raker, Jr., 1838 to his death in 1842; F. W. Krause, 1836 to 1846; Frederick Reinwald, 1845 to about 1847, when he was killed by a panther; L.K. Garfield, 1847 to 1856; John C. Bastian, 1850 to 1852; Charles Ridenbach, George Hammon, Thomas Steward, and W.W. Webb, each of whom made but a short stay. Dr. William F. Weseman came in 1851-52, and is still a resident of the borough. The other resident physicians are Dr. G.A. Smith, who located in 1874, and Dr. Z. Ellis Kimble, who came in 1886. The following named persons have served as justices of the peace since the organization of the township: John Gray, 1825; John Marvin, 1825; re-elected, 1836; Ephraim B. Gerould, 1827; Thomas Dyer, 1827; Chauncey Alford, 1827; James C. Turner, 1828; Thomas Putnam and David Ellis, 1830; Rufus Smith, 1831; Joseph Aiken, Daniel N. Hunt and Martin Robinson, 1832; James R. Ray, 1833; John F. Donaldson and Alanson Miller, 1834; Daniel Holiday, Jr., Solon Richards and William Hill, 1835; Simeon Houghton, Levi I. Nichols and Alfred Ripley, 1836; Evan Harris, 1837; Edwin Dyer and Isaac Drake, 1838; Isaac Werline, 1940; re-elected, 1845, 1850; John Cochran, 1840; Charles F. Veil, 1845; re-elected 1850, 1859; Jackson J. Werline, 1853; re-elected 1858, 1863, 1872, 1877, 1882, 1887, 1893; C.L. Farnsworth, 1855; Robert C. Cox, 1862; William L. Keagle and J.G. Albeck, 1867; William Foulkrod, 1869, re-elected, 1875; Isaac F. Wheeland, 1881; Francis M. Sheffer, 1886; John Hagerty, 1889; re-elected, 1894; John Mase, 1894. The justices of the peace elected for Liberty borough have been Isaac F. Wheeland and J.J. Werline, elected in 1893. The first school attended by children of the early settlers in and around Block House, was taught by Isaac Foulkrod, in a log cabin across the road from the present residence of Levi Miller, in Jackson township, Lycoming county. The next school building stood near the old burying ground in the northern part of the borough, on land now owned by Grant Sebring. After it became unfit for further use, a building was erected near the grounds of William McVoy. In 1859 the present graded school building in the northern part of the borough was erected. Early schools were also established at Hartford, Nauvoo, East Point, Sebrings and other places in the township. Among the early teachers were George Roberts, John Sloat, Henry Keagle, a Mr. Spaulding, William Gilday and others. There are now eleven schools in the township outside of Liberty borough, in the graded school of which two teachers are employed. An average of seven months is taught each year. The school houses are well built and well furnished. Frieden’s Evangelical Lutheran Church, situated across the line in Jackson township, Lycoming county, below Liberty borough, stands near the site of a log structure erected in 1827 by the members of the Lutheran and German Reformed churches, and formally opened for worship in 1828. The present brick edifice, costing $7,000, was erected in 1871. The original members of this church comprised a large number of the early German families in Liberty township, from whom the membership of the churches at Hartford, Nauvoo and Sebrings was drawn. This church has been served by the following named pastors: Revs. J.P. Shindle, Schultz, Deich, Dultman, D.B. Sours, Fritzinger, L.S. Shade, H. Daniels, Studebacker, Brienenger, Frey, I.P. Neff, A.B. Miller, A.H. Schultz, A.H. Weaver, and the present pastor, Rev. D.B. Lau. A church edifice, costing $3,000, was erected in Liberty borough in 1896, and a separate congregation formed. Salem Evangelical Lutheran Church at Hartford was organized about fifty years ago. It worshipped for several years in the Hart school house. A church building was finally erected and used until 1893, when the present handsome edifice, costing over $2,500, replaced it. The church is prosperous and maintains a good Sunday-school. It has had the same pastors as Frieden’s Evangelical Lutheran church. This church was incorporated June 9, 1870. The Evangelical Lutheran Church at Nauvoo was organized about twenty-five years ago. It has no house of worship, but uses the Union church building. Its members are residents of the eastern part of Morris and the western part of Liberty townships. It has been served by pastors of Frieden’s Evangelical Lutheran church. The Evangelical Lutheran Church at Sebrings, organized about 1860, has heretofore worshipped in the Union church building. In 1896 the society erected a new house of worship, costing $2,000. The church is in charge of the pastor of Frieden’s Evangelical Lutheran church. Rev. John Seybert. Services were held in Frieden’s church up to 1847. In 1848 the present church building in Liberty borough was completed. A large number of the early German families in and around Liberty, East Point, and other places in the township, formed the original membership of this church, which has been served by the following named pastors: Revs. James Barber, Charles Hammer, Mr. George, Thomas Epples, Uriah Everhart, Charles Lindelman and Daniel Kehr up to 1848; Simon Wolf, 1849; Mr. Stambach, 1850; Michael Zulauf, 1853-55; H. Price, 1857; Simon Aurend, 1860; Alexander Longsdorf, 1861; A. Rearick, 1863; J. Bowersox, 1865; P.H. Rishel, 1867; Thomas Norris, 1869; Z. Romburger, 1870; M.W. Harris, 1871; J.M. King, 1873; H.N. Greninger, 1876; M. Sloat, 1876-79; Noah Young, 1880; James M. Price, 1881; F.S. Vocht, 1883; James Sechrist, 1883-86; William Minkler, 1889; William Brillhart, 1891; G. Heinrich, 1895, and J.W. Hammett, 1896. This church has a large membership and maintains a well-attended Sunday school. A branch of it has held meetings in the Beuter school house, north of Hartford, since about 1855, and another branch has met in the Frock school house, three miles southwest of Liberty, for about twenty-five years. The Evangelical Church of Nauvoo was organized about 1859, and is composed of members residing in the western part of Liberty and eastern part of Morris townships. The society worships in the Union church building. It has been served by the same pastors as the church in Liberty. The Evangelical Church of East Point was organized as a branch of the church at Liberty, and drew its original members from the parent church. It has been served by the same pastors. Its members held their early meetings in the school house. In 1870 the present house of worship, which cost $1,700, was erected. This church maintains a Sunday-school with about forty teachers and pupils. The superintendent is John Shick. The Methodist Episcopal Church of Liberty was organized in 1842, by Rev. Mr. Smith, of the Genesee conference, the early meetings being held in the old Liberty church. A building was erected and dedicated in 1851. It stood on the lot in Liberty now owned by Frank Brion. It was replaced by a two-story building erected in 1867, and the latter in 1868 by the present building, which cost $3,000. In 1853 the church - which is now in the Central Pennsylvania Conference - was transferred to the Baltimore conference, since which time it has been served by the following named pastors: Revs. B.B. Hamlin, 1853; J.D. Ever, 1854; R. E. Kelley, 1855-6; David C. Wortz, 1856-57; James Gamble, 1858; N. Shaffer, 1859-60; James Hunter, 1861; J.T. Wilson, 1862-63; P.B. Bush, 1864; R.E. Kelley, 1865; M.L. Drum, 1866-67; Elisha Shoemaker, 1868; R.H. Colburn, 1869; Levi G. Heck, 1870; E.M. Chilcoat, 1871-72; J.F. Craig, 1873; A.C. Crosthwaite, 1874; Isaiah Edwards, 1875; H.S. Lundy, 1876-78; J.P. Long, 1879; I.A. Patton, 1880-81; J.F. Glass, 1882; W.H. Bowden, 1883-84; G.E. King, 1885-87; O.G. Heck, 1888; Wilfred P. Shriner, 1889; J. Guldin, 1891; R. T. Whiteley, 1892; M.J. Runyan, 1894, and I.J. Reeser, the present pastor, who took charge in April, 1896. This church now numbers thirty members. The Sunday-school, which was organized in 1851, contains about sixty pupils. Michael Sheffer is the superintendent. The churches at Nauvoo and at the Plank school house, in Morris township, are in this charge. The Methodist Episcopal Church at Nauvoo is the outgrowth of a class organized about fifty years ago, the early meetings being held in private residences and in the school house. The society now meets in the Union church building. This church has always been in the Liberty charge, and has been served by the pastors of the church at Liberty. Its members reside in Liberty and Morris townships. The Universalist Church was organized in 1861 at Shoptown. A frame house of worship was erected and regular services maintained until about 1880. The first pastor was Rev. Walter Bullen. His successor was a Rev. Mr. Carpenter. The society as an organization has passed out of existence. The United Evangelical Church of Liberty is a member of the new denomination resulting from differences arising in the general conference of the Evangelical Association some years ago. A number of the members of the church in Liberty withdrew from the old society and joined the newer organization, adherents of which are also to be found at Nauvoo and in the Beuter school and Frock school neighborhoods. The church in Liberty numbers fourteen members, and maintains a Sunday-school, of which Samuel Hartman is the superintendent. Meetings are held in a rented building. Rev. M. Kennelley was the first pastor of this church, which is now served by Rev. L.M. Dice. The Ebenezer United Evangelical Church of East Point was incorporated June 3, 1895, in which year a handsome church building, costing $3,000, was erected. The society has been in existence about five years, and has had the following pastors: Revs. J.B. Fox, S.W. Stover and D.W. Miller, who came in the spring of 1896. The church now numbers ninety members, and maintains a Sunday-school of about 105 pupils, of which Joseph Roupp is the superintendent. Union Churches are to be found in Nauvoo, Sebrings and at Shoptown. The one at Sebrings was erected in 1863, that at Nauvoo about 1870 and the one at Shoptown in 1891. The latter church is a neat and attractive edifice, costing $1,500. A Union Sunday-school is maintained here with about forty pupils. Mrs. Murray Mase is the superintendent. Cemeteries and burying grounds are to be found in various parts of the township. The old Block House burying ground, in which the early pioneers were laid at rest, was in the northern part of the present borough. Another old cemetery was in the rear of the Evangelical church. There is a cemetery adjoining the Lutheran church, near Hartford, and one adjoining the Union church at Sebrings. The cemetery at East Point was incorporated in June, 1895. In each of these, as well as in private burying grounds, rest the remains of the first settlers of the township and those of many of their descendents. No. 1047, P. of H., was organized November 2, 1891, with sixteen members. It now numbers 100 members, and meets regularly at Sebrings, where it owns a hall building, erected in 1892 at a cost of $500. Nauvoo Grange, No. 1056, P. of H., was organized in February, 1892, with eighteen members. It now numbers fifty members. Its place of meeting is Nauvoo. Washington Camp, P.O.S. of A., was organized February 11, 1892. It meets in the Odd Fellows’ building, in Liberty, and has 145 members. Zimmerman Castle, No. 457, K.G.E., was organized September 6, 1892, at Nauvoo. In the fall of 1893 it erected a hall building costing $1,200. It has a large membership. A Farmers’ Alliance, with a large membership, was recently organized in the Beuter school house neighborhood. It meets regularly and is prosperous. As already stated in the portion of this chapter dealing with the pioneer settlements, Anthony, who kept the old Block House tavern, was the first settler on the site of Block House, now Liberty borough. In 1813 he was succeeded as landlord of the old Block House tavern by Jonathan Sebring, who kept a well-ordered and reputable house. He later erected a better building on the site of the Block House. Among his early successors were a Mr. Morris, Joseph Hagenbach and Joel H. Woodruff, who purchased the property in 1841, and in 1847 built a new house. He continued the business until 1869, since which time there have been a number of landlords. A. Semsey took charge in 1881, and in 1886 the present hotel building was erected. The Eagle Hotel was opened in 1866, the first landlord being A. Artley, whose successors have been Gurdon Felter and Henry Barrow, John and Charles Foulkrod, Robert C. Sebring and his son, Grant Sebring, who has owned the property since 1887. The first store was opened in 1832 by Joseph Hughes. Among the earlier and more prominent merchants have been John Sebring, 1835; Charles Hagenbach, who began business about 1837; Charles H. Cochran, 1840; Robert C. Sebring, 1840; C.H. Hensler, 1842; John Cochran, 1843; George R. Sheffer, who opened a grocery in 1849; I. & H. Ulman, who opened a store on Jew Hill, about 1850; Robert C. Cox and others. Liberty has always been a good business point. It is in the midst of a fine farming section and commands the trade of a large number of thrifty and prosperous farmers. Its business center is compact and well-built and its business men public-spirited and enterprising. 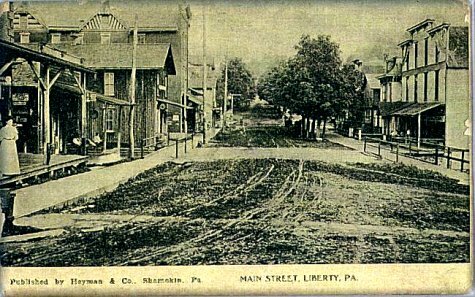 Liberty was incorporated as a borough July 3, 1893, and was duly organized by the election of the following officers: I.M. Warriner, burgess; F.M. Sheffer, J.W. Guernsey, C.A. Maneval, Z.E. Kimble, D.O. Hartsock and Israel Faver, councilmen; J.F. Wheeland and William Foulkrod, justices of the peace; John Foulkrod, assessor; J.E. Keagle, constable and collector; W.W. Woodruff, high constable, and G.F. Brion, Merton Miller and M.M. Werline, auditors. Nauvoo is situated on the western line of the township, about a mile north of the county line, lies on both sides of Zimmerman’s creek, and is partly in Morris township. It was named by Mrs. Lydia Jane Pierson, because during the Mormon excitement a few persons living in the neighborhood became adherents of that faith, and went with the Mormons to Nauvoo, Illinois. She and her husband, Oliver Pierson, were pioneer settlers here, coming into the township as early as 1822, Mr. Pierson having previously invested in 1,000 acres of wild land lying in and around the village. A postoffice was established here in the early forties, C.A. Comstock being the first postmaster. The office has since been held by D.W. Canfield, John Compton, L.A. Comstock, Benjamin Maneval, John Sebring, John Childs, J.S. Childs and Miss Maggie Ritter, who was appointed in December, 1895. The first merchant was D.W. Canfield, who opened a store about 1850, in which year, also, C.L. Farnsworth opened a hotel. In 1862 this house was kept by L.L. Comstock, and has since had numerous landlords. The present one, John R. Childs, has kept the house since 1886. There are two general stores in the village, one carried on by Joseph Childs, who has been in business since 1865, and the other by John Hagerty. A grist-mill, already noticed, is operated by Adam Coppersmith. A Union church, a Grange hall and a school comprise the buildings devoted to public use. the Union church, erected in 1863, and the Lutheran church, erected in 1896 – also a Grange hall. Shoptown, so named from the wagon shop of Solomon Blanchard erected over thirty years ago, is about two miles northeast of Liberty, on the Canton road. A second wagon shop was started here by Charles Weigand. Both were discontinued a number of years ago. There are two church buildings here – the Universalist and the new Union church building. East Point is situated on the Canton road, about a mile west of the eastern line of the township. A postoffice was established here in 1880, P.W. Shick being the first postmaster. His successors have been Joseph Bickler, Henry Gleckler and Daniel Boger, appointed in October, 1894. C.D. McCracken, the deputy postmaster, also carries on a general store. There are two church buildings here, the Evangelical and the United Evangelical, also a public school building. Hartford is the name of a postoffice about three miles east of Nauvoo, on the Canton road. A postoffice named Barfelden was maintained here for many years and then discontinued. The present office was established in 1890, the first postmaster being Harry Darling. M.W. Hart, the present postmaster, was appointed in 1891. He also carries on a general store.